Winter inversion season is here (collective sigh) and the Salt Lake Valley is currently in the grips of it’s first official inversion. While periods of poor air quality can feel overwhelming, we’re here to offer five simple things you can do to limit your impact and protect your health. As we all know, whatever we put into the air during an inversion, we’re stuck with. So every little bit helps! 1. Drive Less. You know the statistic. You probably don’t want to hear it anymore. But there’s no getting around it. According to research from the Utah Department of Air Quality, 57% of our air pollution comes from motor vehicles during a typical winter day. One of the best things you can do is avoid a “cold start.” Cold starts occur when you start your vehicle after it has been resting more than an hour. The vast majority of the pollution from a car trip is emitted during those first few minutes after a cold start. So find opportunities to leave your car at home, whether it is carpooling, walking or simply staying in! 2. Be idle free. If driving less seems daunting, make a positive impact and commit to be idle free. That means not idling your vehicle to warm it up in the morning and turning your key while waiting in parking lots. And skip the drive through window altogether! Learn more about Salt Lake City’s Idle Free Ordinance. 3. Take public transit. We have an expansive transit infrastructure and we’re not afraid to use it! During the holidays, UTA is offering a special promotion on their group pass – up to 6 people can travel all day for just $15. So gather the family together and make getting there an adventure too! If you are anxiously awaiting Salt Lake City’s discounted transit pass for residents, check out these FAQs. 4. Just say “no” to wood burning! A recent study conducted by the University of Utah has revealed that wood burning likely plays a much bigger role in our winter air pollution than previously thought. Wood burning is so inefficient that you could heat 90,000 homes with natural gas for the same amount of air pollution generated. If you see a household burning on a mandatory no burn day, let them know just how much they are contributing to the poor air quality. You can also report them using this online form. 5. Protect your health. 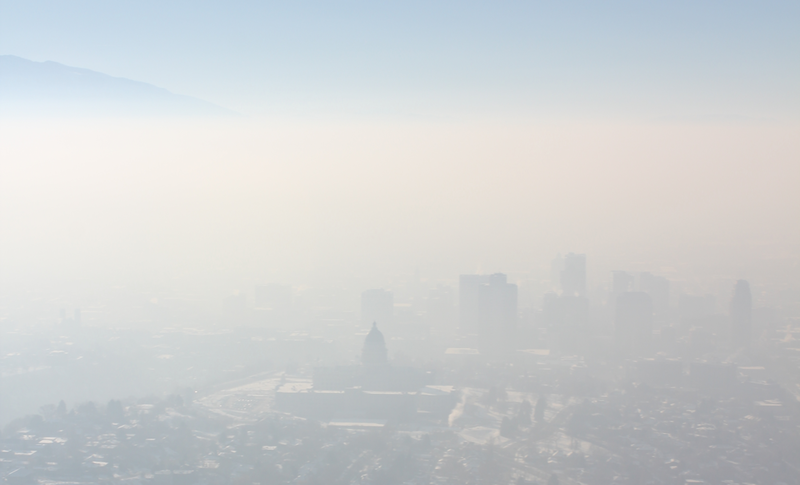 Learn about the health advisory levels used by the Utah Department of Air Quality, which includes recommendations to limit or avoid outdoor activity. You can stay up to date on current levels of PM2.5 with the UtahAir app for iPhone and Android. Or sign up to receive email alerts on their handy website.